Interior view of the new Marshall Athletic Facility on Wednesday, Sept.. 3, 2014, in Huntington. HUNTINGTON, W.Va. — The moment that supporters of Marshall University athletics have been waiting for will come to fruition this weekend. 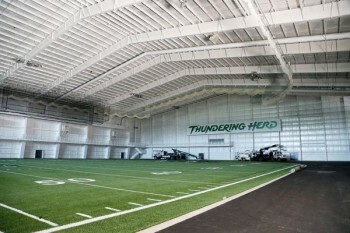 A ribbon-cutting ceremony for Marshall’s new indoor practice facility is set for 4 p.m. Saturday, Sept. 6, at the facility located at 2211 3rd Ave. The event is invitation-only for the more than 1,000 contributors to Marshall’s VISION Campaign, which was the sole source of funding for the athletic complex that houses the facility as well as the Veterans Memorial Soccer Complex, which was completed in August 2013. The former NBA head coach Mike D’Antoni and former Marshall University standout Chad Pennington served as co-chairmen to the campaign, and they will be on hand during the ceremony, said Marshall University Athletic Director Mike Hamrick. During Wednesday’s Board of Governors meeting on campus, some board members alluded to the fact that the facility would be named for Chris Cline, majority owner of privately held Foresight Reserves LP. Hamrick would not confirm or deny that information Wednesday, saying he wanted to release the official name of the facility during Saturday’s ceremony. Cline, a Beckley native and Marshall alumnus, donated $5 million to the campaign in its early stages, and it has been rumored that Cline offered to donate the final $3.5 million to help the campaign reach its $30 million goal.